Dorset Police is to cut the number of its traffic officers and civilian staff by 40%, the BBC has learned. The cost-saving measures will mean 18 of the force's 54 (33%) traffic officers will work on general policing duties rather than highways patrols. It says the change will help all of the force's uniformed officers to become more aware of road safety as a result. Motoring group the AA claims the move will put drivers at risk. The other 7% of cuts will come from support staff. The figures were obtained by the BBC under Freedom of Information laws. 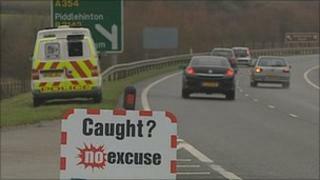 Dorset Police believes road safety in the county will improve overall. Ch Supt Martin Hiles said: "The road traffic officers have been asked to go and work with their general patrol colleagues doing local safer neighbourhood and response patrol policing, and teaching them about road safety. "It is something that every single uniformed officer including myself can do and has done. "If I can do it, if safer neighbourhoods can do it, and general patrol can do it, then actually we will make Dorset's roads continue to become safer and safer." Andrew Howard, from the AA, said: "Patrolling the roads is pretty vital for road safety. "Cameras and technology can do many things but [what] they can't do is root out the really bad driver."